Bear's Paw is a very popular quilt block and so of course, there will be variations of that block. This version is one of those - Bear's Paw Variation and the only difference is the centre of each "paw". 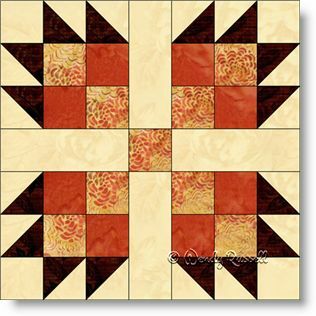 This seven patch quilt block is one of many that are built in the same uneven nine patch style, with all the same pieces but differences in colour and/or value placement. I have listed some of those similar blocks below. The sample quilt illustrations give you two versions of quilts made with only this one block -- a straight setting and an on point layout of the blocks. They are very different indeed.